Could LG be the next company to announce a Chromebook? LG is expected to unveil the Nexus 5 by the end of the month, but it may also be planning to get even cozier with Google software by launching its first Chrome OS devices. The South Korean electronics manufacturer has trademarked the revealing names ChromeOne, ChromeDesk and ChromeStation, discovered TMWatch. These names, registered by LG on October 16, sound an awful lot like laptops powered by Google's browser-based operating system. However, the trademarks are technically categorized into a wider class of technology, from projectors and speakers to set top boxes and tablets. If LG were to launch three Chrome OS laptops, it would fit right into an emerging trend of tech companies producing low-powered Windows alternatives. HP just launched the sleek-looking, but budget-friendly Chromebook 11, and Samsung has been doing the same for its Samsung Chromebook line, now up to Series 3. 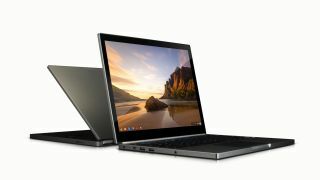 Acer is also involved, manufacturing the AC700 and C710, while Google itself covered the high end with the expensive Chromebook Pixel. ChromeOne, ChromeDesk and ChromeStation could fit right in with the competition, and pair up nicely with the forthcoming Nexus 5.